I spy with my little eye something beginning with……….TEA!!! With my journey into the world of loose tea gathering momentum I thought it was high time I visited a tea house local to me with more than your average cuppa to offer. The city of St Albans is awash with cafes and coffee shops but standing proud amongst them is “Kanuka”. This is reflected in its name which is Mauri for a hardy tree Native to New Zealand, it grows tall and fast, withstanding all weathers to flourish. The decor is sophisticated with not a scrap of chintz or a vintage tea set in sight. Sleek wooden furniture and window seats maximise the space, all stylishly co-ordinated with mustard yellow furnishings in geometric prints. This look is echoed in their packaging; minimalistic grey pouches and polished silver urns contain the array of loose leaves on offer. The ambience is set off nicely by the acoustic chart music being played in the background. As you enter you are faced with a sensory wall of teas housed in a bespoke dark wooden shelving unit. An apothecary of tea with each displayed exquisitely in its own down lit cubby hole. The prepackaged product is regimentally lined up ready for purchase and below each an open jar of leaves for you smell before you try. An information sheet tells you all you need to know and more about each leaf; where it was picked, caffeine content, flavour and how to brew it to bring out its best. For a budding tea geek like myself I was in heaven and could have spent all morning sniffing, reading and tasting the varieties on offer. Being faced with this much choice is daunting but thankfully the teas are split into sections to help guide you. 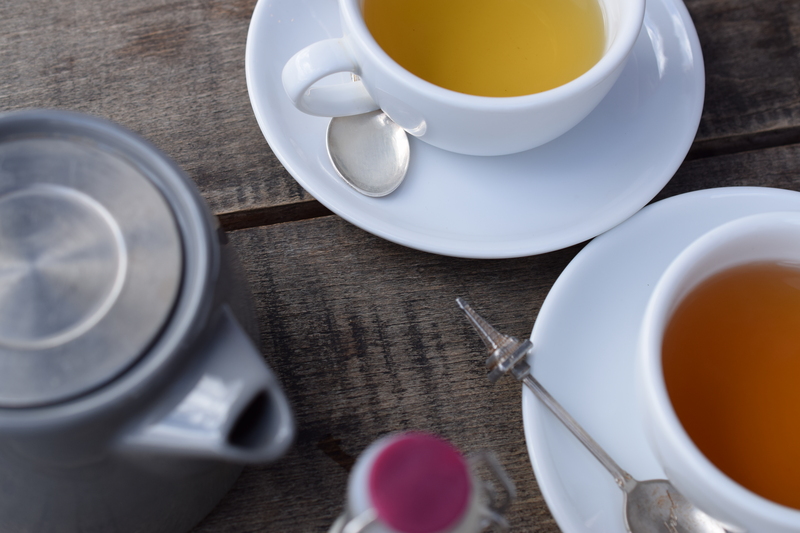 You can choose from the more traditional black teas, try something less common in the green or white tea section or perhaps one of their wellbeing blends would be your preference. The staff are very knowledgeable and were on hand to assist. So many of the teas smelt amazing I found it hard to narrow it down. Finally deciding on two teas that come under the green tea umbrella, partly because the smell was divine but also the leaves themselves looked so interesting. Cleverly each tea is served in an insulating glass cup so I had plenty of time to enjoy both brews warm. Firstly I chose the Jade Oolong, not a tea I had heard of before but you have to admit it sounds pretty amazing. This tea originates from Taiwan & Vietnam and the leaves were twisted into “nuggets”, the info sheet describes how the heat from the water slowly unravels each nugget as it infuses. Unfortunately when you buy a cup you don’t get to witness this process but I was intrigued buy the look of this tea. The leaves had quite a deep, intense floral smell. Quite earthy so I expected a relatively strong brew. When it was served I was surprised with how light in colour it was, like smooth honey. In contrast to the strong scent the flavour was light and the floral notes not over powering. Transporting me to somewhere humid and tropical where your senses are brought alive. The info sheet described it as being “buttery” which I initially found confusing but half a cup in I got that smoothness on the pallet which lingered with each sip. My second choice originated from China and was slightly more familiar to me in flavour but not in leaf; Jasmine Pearls. The indisputable scent of summer, floral and light. The leaves were indeed pearls of flavour, wound tightly into little balls. As with the Oolong I imagine they look stunning as they brew but this step it only witnessed by staff when you order a cup. I wondered if the brew may be too heavily perfumed but was pleasantly surprised. Even lighter in colour that the Oolong, the palest of yellow kissed the steaming water as the light shone through the glass mug. Much more floral on the pallet than the Oolong but what it lacked in smoothness it made up for in freshness. If I closed my eyes I could almost feel the sun on my skin and the grass beneath my feet. Perhaps the most shocking part of this experience is that I didn’t feel the need to partner these brews with any cake! Believe me no one is more surprised than me. There was a selection of sweet and savoury treats on offer but the emphasis is on the tea. I personally didn’t feel a slice of cake would have enhanced my experience and looking around the busy store it was obvious others felt the same. This is the place to tantalise your tastebuds with a brew from a far flung destination, push your boundaries and open your senses up to a new adventure. It’s easy to be intimidated by fancy names that you cant pronounce and leaves that resemble pot pourri but this is not a pretentious establishment that will look down their nose at you when you mispronounce Lapsang Souchon. This is the place to learn something new and try something new, but if you prefer you can order a coffee or their Proper Builders Brew! As the guy who started Kanuka was originally a builder by trade I imagine you cant go wrong with that.